Welcome to the home page for the Sprites 99 Balloon Campaign. Take a look at What's New in our web. 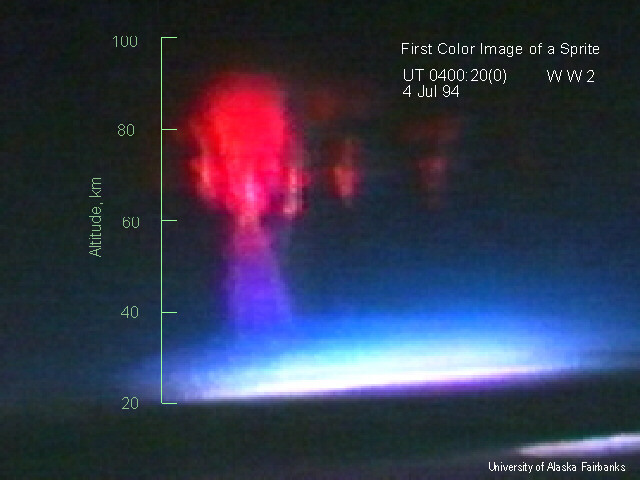 First Color Image of a Sprite Ever Recorded (Image Copyright University of Alaska, Reproduced with Permission). There are so many good sprites pages out there, it would be a shame to reproduce them. Here are some good links. (a).The possibility that visible light emissions can occur in the mesosphere and ionosphere above thunderstorms has been the subject of speculation and rumor for many years. The development of fast low-light level video recording technology has revolutionized this field of study. Exciting new observations have confirmed the existence of such emissions, which have become known as red sprites, blues jets, elves, and anomalous optical events (AOE's). These observations have generated an enormous amount of interest in these emissions and have raised several important scientific and technical questions. These questions include the following: (1.) How are the emissions excited? In particular, what is the nature of the electromagnetic fields involved in the excitation process? (2.) How much dc electric current, if any, do sprites, jets, elves and AOE's deliver to the ionosphere? (3.) What produces the differences between the three types of event? (4.) Are the reported atmospheric gamma ray bursts associated with sprites? (4.1) If so, are the causative energetic electrons locally accelerated or are they precipitated trapped radiation belt particles? (5.) What is the effect of electric fields radiated by lightning strokes and sprites on the ionosphere? A range of effects have been suggested that include optical emissions that are distinctly different from sprites, heating, density enhancements, electron acceleration and gamma ray emission. (6. )What is the role of sprites, jets, elves and AOE's in the excitation of the global circuit? (7. )Which of the rapidly proliferating set of models of these events are correct? This proposal requests support for a set of balloon and airborne experiments that can make a contribution to answering these questions. The proposed balloon paylaod will carry three axis broad band electrci field and magnetic field detectors with sufficient dynamic range and bandwidth to resolve the expected sprite excitation field and to distinguish between ac and dc excitation mechanisms. A gamma ray spectrometer consisting of a scintillation counter and a pulse height analyzer will also be flown. These payloads will be flown during the summer of 1998, hopefully in conjunction with the continuing activities of other investigators. (c.) In year 1, we will design and construct three balloon payloads with electric field, magnetic field, X-ray counter and photometer instruments. In year two, we will complete the payloads and fly them 4 times apiece from sites in or near western Iowa and Missouri, in conjunction with ground-based observations. In year 3, we will analyze and publish the results. (d.) NASA is presently supporting an active program of airborne observation of sprites and related phenomena. This program will extend and complement those investigations. It will contrbute to understanding of gamma ray emissions of terrestrial origin observed by the BATSE instrument on the Compton Obervatory. By contributing to our understanding of troposphere-ionosphere coupling, it will complement and extend aspects of the UARS and TIMED missions. The following is a list of recent additions to our web. Whenever we publish a paper, write a specification, submit a status report, or add anything else to our web, we'll put a notice here. Every month we'll remove the oldest items. The most recent changes are listed first, and each item is linked to the page with the updated content. Activated Seach and Discussion Features. For problems or questions regarding this web contact eabering@uh.edu.